Josh grew up on a farm in the hills and hollers of north Alabama. He came to South Carolina in 2005 to pursue a PhD in colonial American history, focusing on the religious and intellectual history of the New World. Whether conducting research, writing lectures, or drafting his dissertation, he found pipes to be his constant companions and spent his free time learning as much about pipes as he could—even attempting (much to his wife’s annoyance) some rudimentary restorations at the kitchen table. 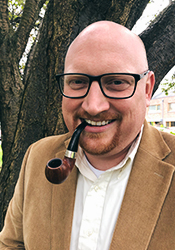 After completing his post-doctoral teaching fellowship in 2013, he jumped at the chance to work for Smokingpipes as Sales Manager, going on to serve as General Manager from 2014–2017. When selecting a team for our European branch, Josh's experience in day-to-day operations as well as his deep appreciation for history and tradition well-equipped him for taking on the role of Managing Director. Here in Dublin, he looks after Laudisi’s operations and supervises both Smokingpipes Europe and Peterson. Despite (or perhaps because of) the fact that his work has taken him abroad, Josh remains at heart a small-town, old-fashioned guy. He likes his pubs quiet and dark, his movies classic and starring Grace Kelly, and his ghost stories Gothic. Back at home during his free time, he can usually be found playing the piano (which he one day hopes to master), performing some sort of arduous DIY task on his 1940s fixer-upper, or valiantly persevering in his self-assigned task of completing every book on the American Scholar's list of the 100 Greatest American Novels.